Fr. James Efrayem Soliman was born in Egypt in 1969. He came with his parents to California in 1974 at the age of 4. He earned a B.A. in Psychology from UCLA in 1991. He also earned a Masters in Clinical Psychology with emphasis on Marriage and Family Therapy from Pepperdine University 1994, and a Ph.D in Clinical Psychology with emphasis on individual Family and Child Therapy from the School of Professional Psychology in Pasadena in 1998. He did his post-doctoral residency at Kaiser Permanente Medical Center at Santa Clara in Child and Adolescent Psychiatry and worked at L.A. County Department of Metal Health for three years. Fr. James served as a Deacon, Youth Leader and Counselor at Holy Virgin Mary Church in Los Angeles. 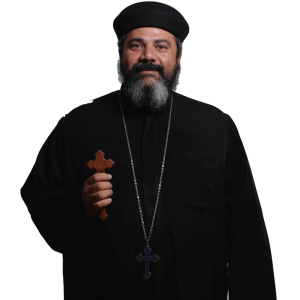 On November, 23 2003, His Grace Bishop Serapion ordained him Presbyter to serve in the same church. He has been heavily involved in marriage preparation classes, youth sports and mental health Services for the Diocese.